With higher fidelity next-generation converters, convenient monitor control options, and both Mac & PC compatibility, the already powerful Apollo Twin just became even more of a "no-brainer!" QUAD DSP Processing. UA has made their wildly popular Apollo Twin even more powerful with their next-generation converter technology for even more clarity and openness (as seen in the newest rackmountable Apollos). On top of that, you’ll find advanced monitoring controls typically unseen on table-top interfaces (mono, mute, dim, alt monitor, and a talkback mic! ), plus the option to go all the way to QUAD DSP to have even more plug-in processing onboard your compact and portable interface. The sum of all these new upgrades and additions takes an interface that was already putting some distance between other similarly priced options (refer to their ground-breaking Unison preamp emulations), and skyrockets it ahead, making the Apollo Twin MKII even more of a no-brainer option for those looking for exceptional audio quality, powerful DSP capabilities, and lightning-fast Thunderbolt connectivity in a compact 2x6 interface. 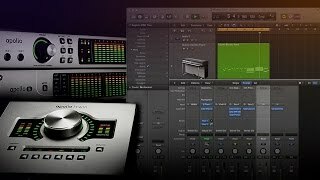 In this short video, UA's Gannon Kashiwa demonstrates the basic setup procedure for Apollo Interfaces within Logic Pro. Topics covered include: Loading The Driver, Setting The I/O Buffer, Using The Console Recall Plug-In, and more. *Apollo Twin MkII includes the "Realtime Analog Classics" UAD plug-in bundle. All other plug-ins are sold separately. All trademarks are property of their respective owners.